It's that time of year. The time when you hear a member of your family cough and you run away hoping you don't get a cold, or worse, the flu! You can Lysol everything, take a ton of vitamin C, but if you're anything like me, its only a matter of time before you get sick. Well now, everything has changed! I want to introduce you to a product I discovered at the WOW Summit back in November, FluNada by STS Health. 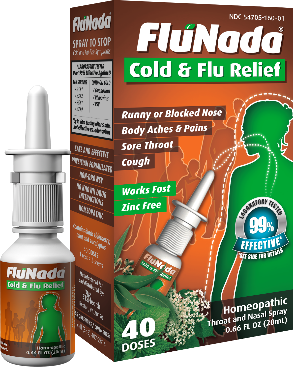 "FluNada is a homeopathic throat and nasal spray formulated to provide relief from cold and flu-like symtoms." Since 90% of viruses enter through the throat and nose, FluNada was developed to be sprayed in the throat and nasal passages. FluNada is made from natural ingredients like Elderberry, Eucalyptus, Gaultheria and Mint. So you may be asking yourself, does this stuff really work? Right before the holidays, Tucker started to get the funk (fever, runny nose, sneezing, coughing, the works). Taking care of a child is a sure way to get sick yourself. When your nursing them, your getting coughed and sneezed on. Just as things were getting back to normal, as I was going to sleep one night, I felt that pain in the back of my throat. The pain that means your getting sick. I remembered talking to the reps for FluNada at the WOW Summit and them saying that if you take it at the first signs of the flu, it can stop it right in its tracks. What did I have to lose? To my shock the next morning, my eyelids were not crusted together, I could breathe and felt completely at 100%. Could this stuff really work that well. Over the next few weeks, I watched as each member of my family was getting sick, one right after the other. Then there was me, the one who normally gets sick, still going strong sticking to my daily dosages of FluNada. Word of warning, this stuff is unique as you spray it down your throat and up your nose. I recommend spraying it up your nostrils as fast as you can becuase this stuff BURNS. In my opinion, two seconds of burning in the nose is better than two weeks stuck in bed feeling really bad. Need to heal, there's a natural way. ​Head over to FluNada's website for a $5 off coupon and to check out where you can purchase FluNada at a retailer near you. Keleigh thanks for writing this great post. I am a huge fan of FluNada. My husband and I took FluNada during our trip to South Africa and I believe it's the reason why we never got sick! Thanks for sharing the $5 coupon as well. I need to stock up on my FluNada to get through the rest of the flu season! Thanks for reading Gina! It's amazing to me that an all natural product can work better at preventing a cold/flu than any over the counter medications I've ever taken!